El Anatsui is an artist. In March 2019, Haus der Kunst will present El Anatsui: Triumphant Scale, a major survey of the work of the acclaimed artist El Anatsui (*1944, Anyako, Ghana), perhaps Africa’s most prominent living artist. This survey — the largest ever mounted on Anatsui’s work —will occupy the museum’s entire East Wing and encompass every media in the artist’s prodigious fifty-year career. As the exhibition title suggests, the survey will focus on the triumphant and monumental quality of Anatsui’s sculptures, with the signature bottle-cap series developed over the last two decades situated at the core of the presentation. Along with these ambitious works, with their imposing physical presence and dazzling colors, the exhibition will also include wood sculptures and wall reliefs spanning the mid-1970s to the late 1990s; ceramic sculptures of the late 1970s; as well as drawings, prints, and books. In addition, Anatsui will create several new sculptures responding to the sweeping scale of the museum’s galleries, including a grand outdoor work on the building’s monumental façade. 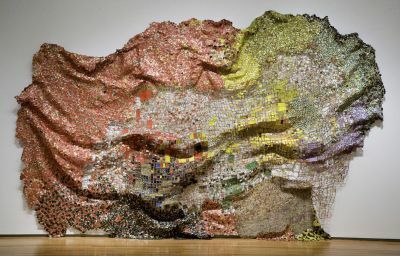 Anatsui’s artistic practice exemplifies a critical search for alternative models of artmaking that in turn question the foundation of modernist ideals of artistic autonomy and aesthetic purity. Based in Nigeria since 1975, when he arrived as a lecturer in the vibrant Department of Fine and Applied Arts at the University of Nigeria, Nsukka, Anatsui’s ideas were formed in the context of a creative environment marked by artistic experimentation, aesthetic research, and creative energy which existed in tandem with the belief that great art can be developed anywhere in the world, independent of the so-called art centers of the West. Anatsui and his contemporaries at Nsukka, which included world-renowned artists, writers, poets, and dramaturges, were motivated by an abiding belief that their work could contribute to enlarging the scope of artmaking in a much-expanded, global contemporary art scene. As Anatsui once stated: “Art grows out of each particular situation, and I believe that Artists are better off working with whatever their environment throws up.” The premise of this exhibition is to explore the variegated paths of creation the artist has taken to formulate a new approach to sculpture, which in turn made him one of the most formidable sculptors of our time. The exhibition is made possible thanks to major funding by the Art Mentor Foundation Lucerne. We further acknowledge the significant support of an anonymous donor; and the generous contributions of Gesellschaft der Freunde Haus der Kunst e.V., Jack Shainman Gallery, New York, Kavita Chellaram, Reni Folawiyo, Bolaji Balogun, and Yvonne Fasinro. The catalogue is published by Prestel. The exhibition is organized by Haus der Kunst, Munich, in cooperation with Mathaf: Arab Museum of Modern Art, Doha; Kunstmuseum Bern; and Guggenheim Museum Bilbao.